“Insight” crew (l-r): Alan Keays, Polly Lynn, Royal Barnard and Laura Vien. 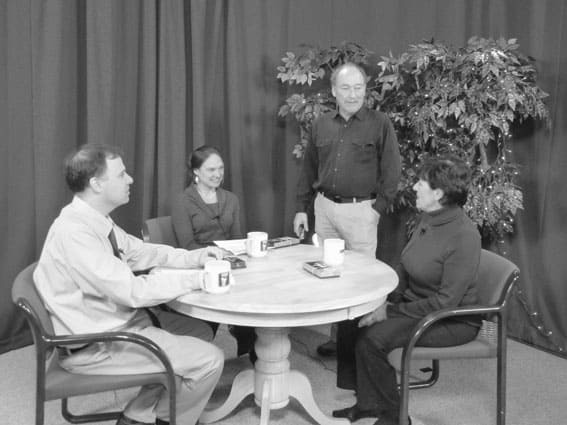 RUTLAND COUNTY — Oct. 22 marked exactly eight years of Royal Barnard’s involvement with “Insight,” a news show on PEGTV Channel 21. After 29 years in the newspaper business as the former owner of The Mountain Times, and eight in TV, Barnard felt it was time to step away from his role as producer. Alan Keays, news editor at The Rutland Herald, and Polly Lynn, editor and co-publisher at The Mountain Times (Barnard’s successor) have shared responsibilities as panelist on the show for the past four years. They will now co-produce it. “I confidently hand you the reins with pleasure and great respect,” Barnard said in a letter to Keays and Lynn. “Insight” was the brainchild of Barnard’s long time friend, Tom Hurcomb, who is also a former PEGTV board president, and supported by PEGTV director, Mike Valentine. The original cast was Royal Barnard and Randal Smathers, then editor at the Rutland Herald, and Laura Vien of RAVNAH as host. Attorney John Valente, a long time PEGTV contributor, also hosted occassionally. The original format was a conversation of current events with “in the know” media persons. Occasionally, guests were invited. The debut of “Insight” was Oct. 22, 2007, at 6 p.m. on PEG TV channel 21. The first program examined three topics, the MetroGroup plant closing and the impact on the region, the Rutland Board of Aldermen’s decision on the 8:50 p.m. whistle and the new owners and new changes at Killington and Pico, according to a press release issued prior to the showing. In recent years, the format of “Insight” has changed to primarily feature experts on current events, topics or issues in Rutland County.